Magellanic Penguins live in an active community with many other animals, like sea lions, king cormorant, Patagonian foxes, elephant and leopard seals, southern right whales and other penguin species, including Gentoo and rockhopper. While penguins use sound to interact with each other, they often communicate through their body language. An example of this is something called an ecstatic display used by males to warn others to stay away during mating rituals. 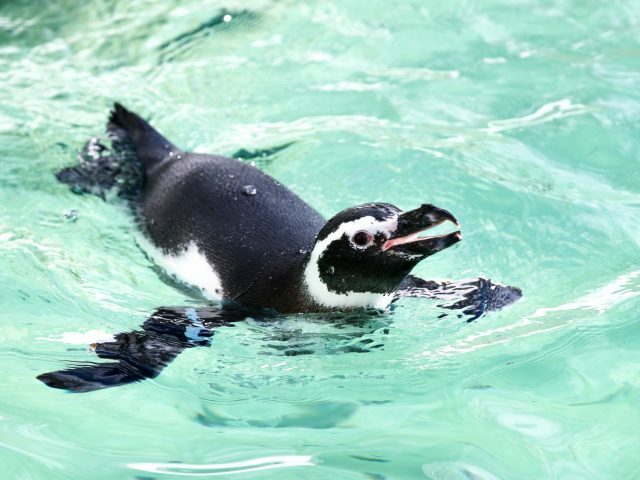 This involves a male penguin standing upright, pumping his chest and pointing his bill and highly stretched neck in the air, moving his flippers up and down and making loud calls. Another is bowing. 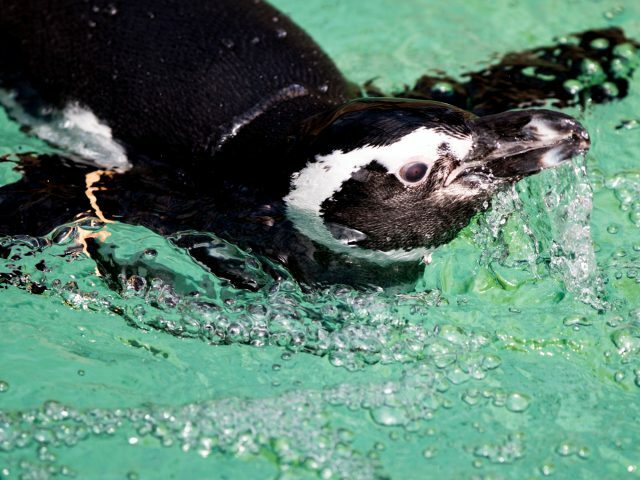 Penguins use this behavior to reduce aggression and strengthen recognition between partners. A penguin (or both penguins) will dip its head and point its bill at the nest or at the other bird’s bill, then emit a low hiss or growl. Magellanic penguins breed once a year and lay 2 eggs. The parents alternate between foraging for food and incubating the eggs until they hatch. Both parents care for the chicks until they are fully feathered and can venture into the ocean. While both chicks may survive, when food is scarce parents may focus all their efforts on just one. Magellanic penguins are noisy, with a bray like that of a donkey. During breeding season, they gather in large nesting communities – with as many as 400,000. There are 18 different species of penguin. 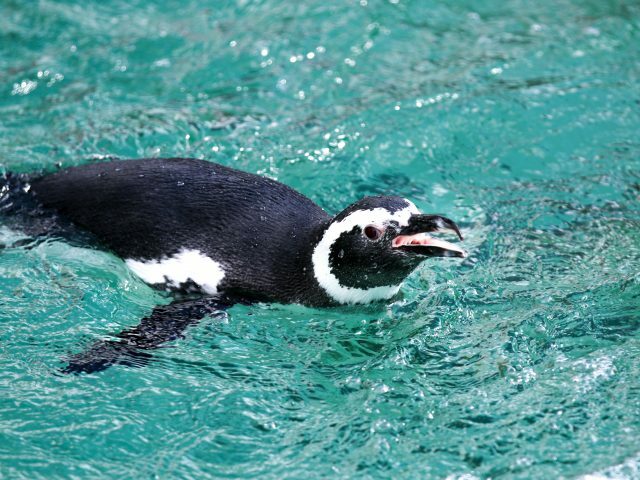 Magellanic penguins dive more than 250 feet in search of food. Emperor penguins can dive up to 1,850 feet! 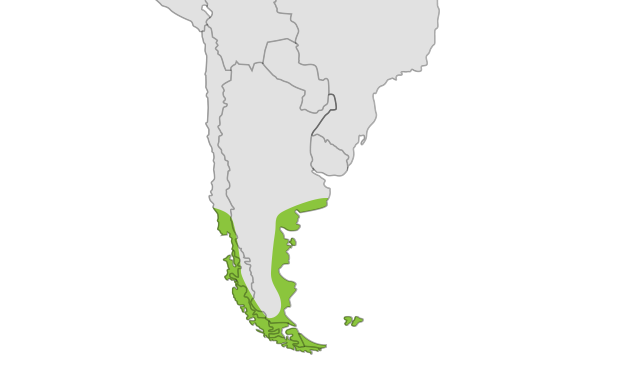 Magellanic penguins mate with the same partner year after year. The females can recognize their mates through their call alone! Penguins in many places are threatened by human activities in the waters and lands where they swim, nest and search for food. Oil pollution is responsible for the deaths of thousands of penguins each year in Argentina and the Falkland Islands. 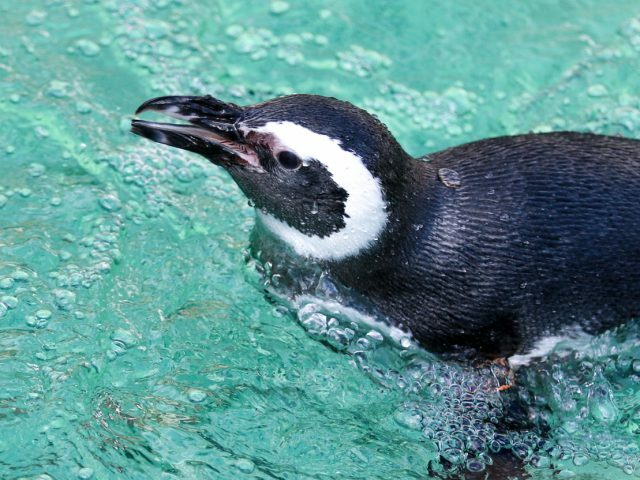 Climate Change: warming oceans means penguins must venture dangerously far to get to food. Commercial fishing depletes schools of fish that penguins and other seabirds depend on for food. Also, penguins can get entangled in fishing nets. Making a difference for the penguins! 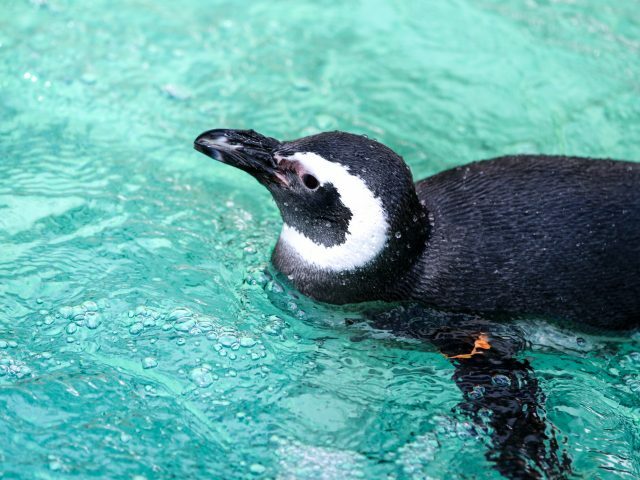 Breed and maintain healthy penguin populations at zoos and aquariums. Take Action Today To Ensure a Healthy Future for Magellanic Penguins! Be aware. Learn about the challenges these creatures are facing. Share your new knowledge with others! Visit your local AZA zoo/aquarium. Know what you eat. Choosing fish that is from a healthy population and harvested in a sustainable and non-destructive manner is the key. This means locally caught or raised fish. 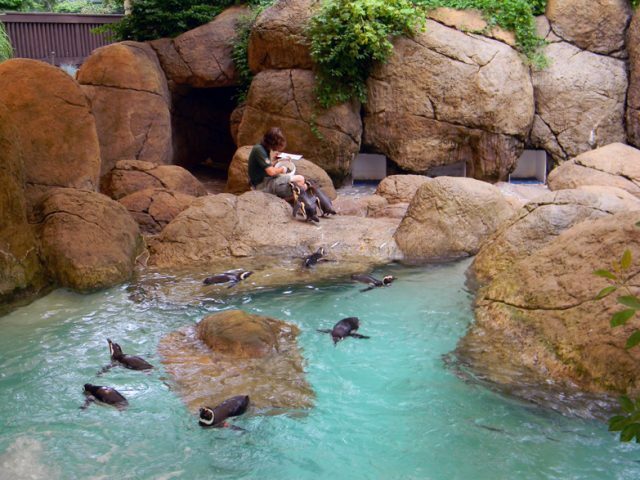 We have a thriving group of Magellanic Penguins live at Potter Park Zoo, many of which were born right here! The males wear their ID bands on right and the females wear their ID bands on the left. Megellanic penguins weigh anywhere from 7 to 10 pounds, and stand 23 to 27” tall.